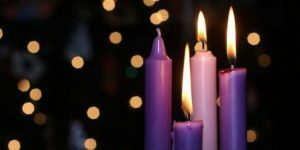 During the four weeks of Advent, we prepare for the celebration of Christ’s birth through prayer and reflection and we look for practical ways to observe the holiness of the season in our everyday lives. 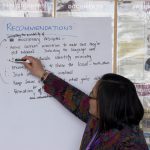 I ngā wiki e whā o te Aweneti, mā te karakia me te whakaaroaro ka whakariterite tātou i a tātou mõ te kaupapa nui, arā te whānautanga mai o te Karaiti, ā ia rā, ia rā ka rapu tātou i ngā tikanga hei whakanui i tēnei wā tapu. Blessed be his glorious name forever; may he fill all the earth with his glory. Upon every high mountain and lofty hill there will be streams of running water. Like a shepherd he feeds his flock, in his arms he gathers the lambs. Wed 13 Bless the LORD, all his creatures, everywhere in his domain. Behold, the virgin shall be with child and bear a son, and they shall name him ‘Emmanuel’ (God is with us). I will sing your glory every day. Most blessed are you among women. Mary said, ‘My soul proclaims the greatness of the Lord’. I am sending my messenger to prepare the way before me. There were so many events, ideas, expectations over the last year that I thought were going to go in a certain direction, but they didn’t! Over time, we learn things do not always turn out as we might expect. 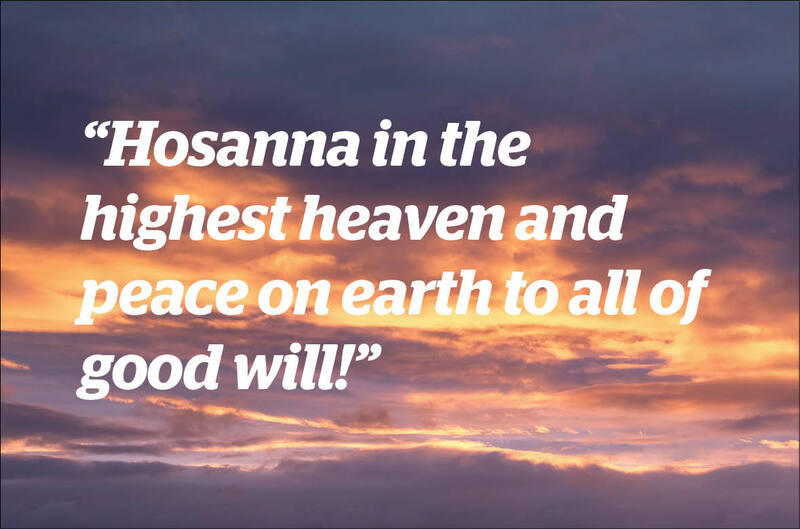 For 1000 years the people of Israel had hoped for a Messiah and were very clear about what the Messiah would be like. But when the messenger came, it was to the poor, guarding their flock; it was to the young woman who was willing to say ‘I hear, let it be’. The place was not in a palace, it was not in the temple; it was in the midst of a family living the political realities of the day (a census) and it was totally unexpected! The message was also unexpected: ‘Peace on earth and goodwill to all peoples’. Jesus and his followers lived and served the poor, the outcast, the leper, the sinner. He and his followers shared whatever they had in community. He and his followers welcome the stranger and visited those who were imprisoned by loneliness and the socially ostracised! This year has taught me to expect the unexpected and to trust the message echoed through the centuries, and to trust in the way that is certainly an alternative, but is not an alternative truth! Love the Lord your God with all your heart, and all your soul, and your entire mind and your neighbour as yourself! As we prepare for the celebration of the arrival of Salvation into our world, the Church offers us the season of Advent as a time of preparation for the joyous occasion of the Nativity of our Lord Jesus Christ. 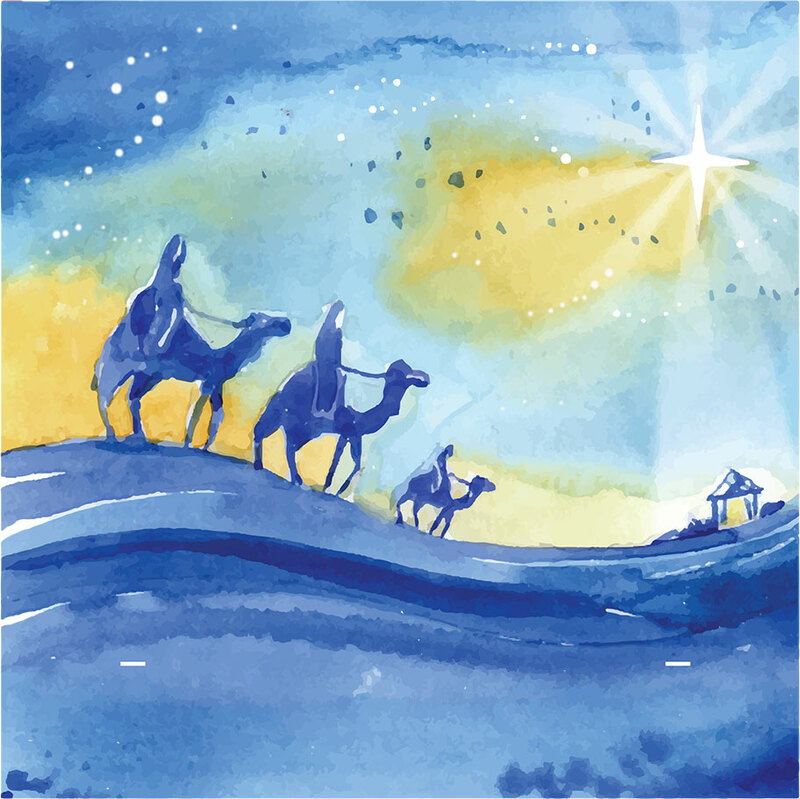 The word advent – ‘coming’ – relates to our faith, it’s past, present, and future. The Advent season dates back to at least 567 when monks were ordered to fast during December, leading up to Christmas. one white – representing the joy and purity of Jesus, lit to Christmas Day. The rose candle is lit on Gaudete Sunday (3rd Sunday). Lighting an Advent wreath for the family meal is a beautiful tradition. 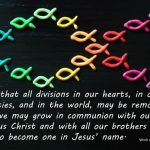 It can help us engage with the season, bring the family together in prayer, and foster a relationship between individuals and the family with the liturgy of this special season. Here is my prayer for you and your loved ones to pray together. Father in heaven, we praise you for your Son, Jesus Christ. He is your greatest gift to us and sign of your unending love for us. During this season of preparation, may we offer ourselves in prayer and service to you and ease the burdens of daily life for ourselves and for others. May we not forget the reason for the season and help us not be consumed by the things of this world, but instead help us focus on the next. Help us to walk in your love and give us patience to wait for His coming. We pray in the name of Jesus our Saviour. Amen. 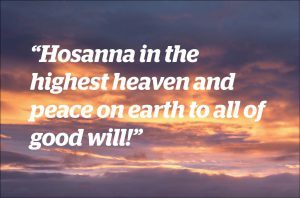 May the peace of Christ be always with you and your family. Is your visual liturgical set up inviting and engaging, denoting a time of great celebration? Is there a warm welcome at the front door – not just a newsletter and a hello! Is it abundantly clear this is a child-friendly zone, for example is your toy and ‘Jesus books’ basket well stocked with a big sign near the entrance inviting their use? Do you have a set of children’s Mass books with pictures available, so the slightly older kids can follow the Mass? Is there a Christmas decoration gift or treat for children after Mass that they can look forward to? Ushers to point out things like crying rooms and toilets and nappy-changing facilities? Is there a fabulous morning tea afterwards where the welcome and fellowship continues – not just a dry old biscuit from last month? Does your newsletter have items of interest and things to be involved in? Is there information obvious and readily accessible about how to enrol in your nearby Catholic school for prospective parents? Is your priest able to invite the children up after for a special Christmas blessing? If it is a family Mass, is it scheduled to use the Children’s Eucharistic prayer? 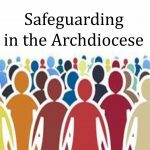 Is the music appropriate to the liturgy and those in attendance? Are you gathering the people early before the Mass to sing carols? Will your priest explain certain parts of the Mass for those who are visitors and maybe non-regular attenders with their non-Catholic spouses? Is the parish geared to actively extending personal invitations to people? 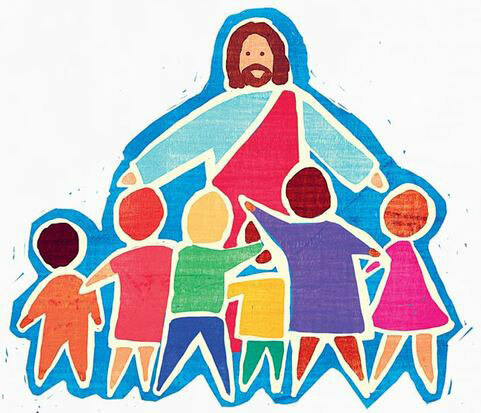 “Let the little children come to me, and do not hinder them – Matt 19:14. With every good wish and blessing on your preparations for this Christmas season! Nick Wilson is TCI and Education Advisor/Tertiary Chaplain, Manawatu, for the Catholic Diocese of Palmerston North. ‘Be on your guard…’. Taking the grandchildren to the beach can be a little nerve-wracking. I need to have the proverbial ‘eyes in the back of my head’ particularly for to the youngest. He has no fear. I am on Super Nana Alert. But it also has its upsides. I am fully present and interacting with them, so I see those ‘wonder moments’ as they explore and make new discoveries in this exciting environment. Moments I would have missed with my head in a book. In this Gospel passage we are being reminded to be watchful, to ‘… stay awake…’ not in the sense that we have to be fearful of our God, but rather stay alert or we might miss another opportunity to experience God’s presence in our lives. We are lucky that our God is a God of love who delights in all of creation and wants us to experience that wondrous joy as well. When I was a keen tramper in my teenage years there seemed to be an unspoken competition between the faster trampers to see who could get to the hut the quickest. Not being as fit I tended to be with the group at the back, plodding along. We had many unplanned stops beside small streams soaking our sore feet, sitting under large Nikau palms sharing our bags of scroggin or taking photo shots of towering mountain tops. There were many God moments. The lead up to Christmas can be so frenetic, that our focus can become skewed. We run the risk of missing those special God moments along the way. So take a moment to stop and delight in the beauty of this present moment. Chris Walkerdine is a graduate of the Launch Out programme for Lay Pastoral Leadership in the Archdiocese of Wellington.